Facial treatments at SerenityBliss are performed by licensed estheticians and tailored to each individual’s needs or skin concerns. We are committed to carrying the finest lines of products that are backed by science and driven by results. Each treatment is tailored for your skin care needs. We strive to achieve the most beneficial treatments, resulting in more rejuvenated, vibrant skin. Our custom facials can address a variety of needs from premature aging and environmental damage, to acne flare-ups and dull or patchy complexions. We are using products and techniques that will precisely fit your skincare concerns. During your facial we’ll conduct a thorough skin analysis, discuss goals and any concerns. Then recommend a skincare treatment plan. Keep in mind that we are the Best in the Woodinville area! After skin analysis each facials are customized to the client’s skin needs and skin type. Read more about the benefits of collagen facials. Fall into Serenity Bliss all inclusive, results oriented, signature European facial. This treatment is customized and designed to reveal radiant skin and reduce signs of ageing by restoring firmness, texture and tone to the skin. It is most relaxing experience for your face. Steam and gentle ex-foliation open the pores and begin the treatment that will have your skin refreshed and glowing. Following by aroma-therapeutic massage combines our essential oils with lymphatic drainage massage to release toxins for your face, neck and décolleté. An antioxidant mask is followed by LED light therapy, which is used to stimulate collagen, even skin tone, kill active bacteria and reduce inflammation. An excellent choice for a de-stressed mind and rejuvenated appearance. Hands and feet always get special treatment. Essential treatment for acne prone skin. This Facial is designed to gently clear the skin of pollutants and everyday bacteria build-up to get results. Treatment includes a complete pore cleansing, followed by an anti-oxidizing mask and Blue U light therapy to effectively treat acne pain or side effects. This powerful treatment leaves skin visibly clear and reduces acne causing bacteria. These highly effective facials consists of Bacteria-busting, deep-pore, cleansing and a custom blended mask. The facial targets the individual needs of the teenage skin, exfoliating and refinishing the skin, targeting oiliness and acne with products and technology best for acne-prone skin. Our age and gender appropriate treatments empower and encourage healthy habits and a solid foundation for years to come. Pregnancy can be a very tricky time for the skin resulting in breakouts and hyperpigmentation. Your facial skin treatment begins with a deep brush cleanse, followed by salicylic free exfoliation. Any necessary extractions are performed and treated with pregnancy safe, plant based formulations. Lymphatic drainage in a face and neck massage will remove toxins from your system, and a vitamin C masque will counteract any free radical damage resulting from sun exposure. Baby safe hand or foot massage is included. We use Diamond Micro tips which interact with the skin to loosen and get rid of the dead skin in deeper layers by exfoliation. This helps stimulate the collagen further to smooth and improve the skin tone and appearance. It gives a great soft glowing skin right out of the treatment. This non-invasive treatment gently exfoliates as a suction lifts away the outermost layer of dead skin cells. It is simple, painless and will rejuvenate your skin. You can do this treatment on it’s own or add it onto any of our facials. Non-surgical face lift. This treatment strengthens and lifts tired muscles tones by exercising muscles with Galvanic microcurrent. 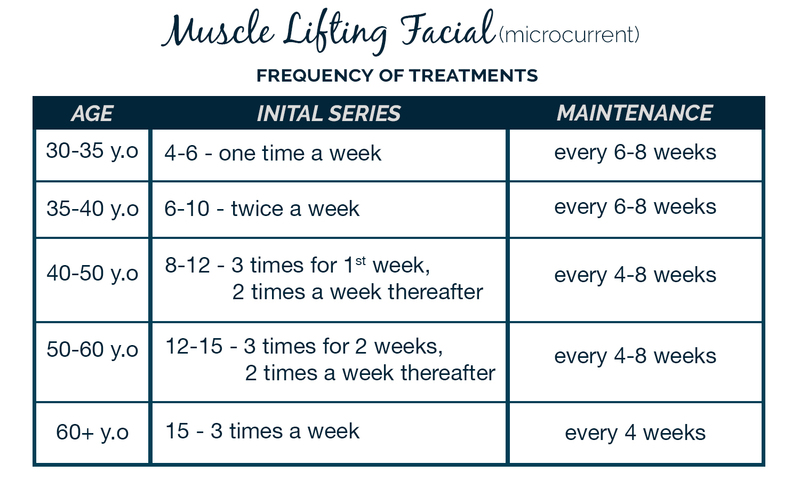 One treatment will reach a 32 facial muscles. MicroCurrent Technology gently manipulates and re-educates the muscles by using a series of precise movements to tone the facial muscles. This process rejuvenates the muscles and returns them to a more youthful tone. Its also stimulates the production of collagen and elastin. It is a technology based skin treatment that uses specific wavelengths of natural infrared light energy to restore skin’s normal, healthy activity. LED light-therapy has been FDA approved for applications such as skin rejuvenation, acne, wound healing. Research conducted by NASA’s space program has proven that near-infrared LED light therapy promotes wound healing and human tissue growth. The energy delivered by red infrared light emitting diodes (LEDs) enhances cellular metabolism. This in turn stimulates the body to build new collagen, increases circulation, and improves the functioning of the lymphatic system. The result is younger, healthier looking skin. Increases circulation through the formation of new capillaries. Increases collagen production for plumper, more youthful looking skin. Increases oxygen and restoration of skin’s natural cellular activity, which keeps skin renewed and fresh. Increased lymphatic system drainage which detoxifies the skin for the healthy look and feel of young skin. Reduces inflammation and redness in skin conditions such as acne and rosacea. Reduces sebum by normalizing the skin thereby helping control acne breakouts. An excellent treatment for all skin types. Blue Light: Eliminate acne-causing bacteria deep within the skin. The result: clear, smooth skin with fewer blemishes, clogged pores, pimples and acne breakouts. Yellow Light: used in the cosmetic treatment of burns (such as sunburns) to reduce the appearance of redness, swelling, as well as other conditions such as Rosacea and Eczema. The skin looks different after the first treatment: smoother and more hydrated with a natural radiant glow. However, since the device is essentially stimulating the body’s natural healing mechanisms, the most visible results are not immediate. Instead, results occur gradually over several weeks. With each treatment you will see improvement. And an effective home care regimen will be recommended that will further While almost everyone can benefit from the use of light therapy, these treatments will have the greatest impact on skin with sluggish metabolism and slow cellular activity showing visible signs of ageing. During a dermaplaning session, the dermatologist or esthetician uses a medical-grade scalpel to scrape (not cut!) across the surface of the skin. The main reason people do it is to remove the vellus hairs on their faces, also known as peach fuzz. Peach fuzz can appear almost colorless, blonde, gray, or brown (or the same color as the hair on your head). Everyone has these fine vellus hairs coating our bodies, and they are meant to keep us warm and add another layer of protection to the skin. But some people’s vellus hairs are thicker and more visible than others, and so they might want to have it removed.